Our portable holding tanks feature easy assembly and disassembly. 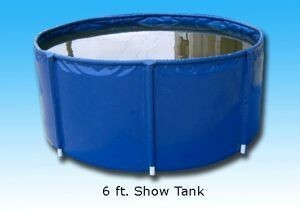 These free standing tanks are ideal for shows, quarantine or temporary quarters. All Tanks are 22 oz. Polyester Scrimmed Vinyl that we use for the transport tanks as well as the in-ground liners. The material is extremely strong and completely fish friendly.